The recent sojourn to the state&apos;s southern stretches has reminded me that there are fantastic museums and cultural sites close to home. Whether exploring the region&apos;s unique history, taking an animated and educational trip to space, or journeying around the world by way of global artworks, the exhibits of the Southern Plains truly enlighten and inspire. In 2009, my hometown of San Antonio extended its beloved River Walk northward, creating what&apos;s now called the “Museum Reach.” This buzzing area features modern and renovated installations, parks, restaurants, and institutions. The Reach&apos;s two largest establishments—the San Antonio Museum of Art and the Pearl Brewery complex—are housed inside former breweries. But while you can sip local brew at Pearl (after shopping or dining), the Museum Reach earns its name with the San Antonio Museum of Art (aka SAMA). I recently walked around its lovely grounds before venturing inside to explore the largest Egyptian, Greek, and Roman art collection in the southern United States. SAMA was the first institution to open its doors along a then-forgotten stretch of the river when it took up residence in the former Lone Star Brewery—the first of its kind in Texas. SAMA launched in the early &apos;80s with a pre-Columbian, Spanish Colonial, and Latin American folk art collection, but has since expanded its focus beyond the Americas. I&apos;m particularly fond of its sizeable Asian art collection (the Chinese ceramics are my favorite). As much as I love international art, sometimes I want a Texas culture fix, and there&apos;s no better place to get it than the Institute of—you guessed it—Texan Cultures. The Institute is located inside Hemisfair Park—a gorgeous downtown gem built for the 1968 World’s Fair in San Antonio—and part of UTSA (the University of Texas San Antonio). Not only does the Institute contain 65,000 square feet of exhibits honoring Texans, but it&apos;s also committed to providing multicultural education and hosts regular events, like the annual Texas Folklife Festival, that celebrate Texas’ many unique residents and cultures. 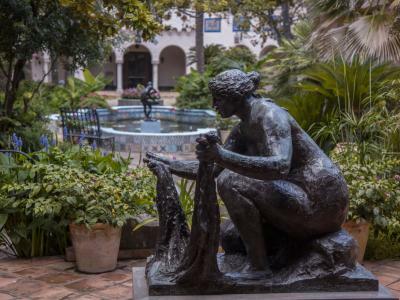 On a recent weekend, I revisited another favorite: the McNay Art Museum in the city&apos;s venerable Alamo Heights neighborhood. Its origins date back to 1918, when wealthy Ohio heiress Marion McNay initially visited San Antonio. Shortly after moving to the city in 1926, she bought her first modern oil painting—Diego Rivera&apos;s Delfina Flores—and soon began collecting artwork while building a Spanish Colonial Revival house that became the museum&apos;s core. Although I&apos;m partial to the original structure, which I sometimes imagine is my own private residence, the McNay welcomed a modern addition designed by French architect Jean-Paul Viguier in 2008. It and the original museum now house nearly 20,000 works that include, among others, medieval and Renaissance art and European and American paintings, photos, and sculptures from the 19th through the 21st centuries. But don&apos;t spend your entire visit inside: the juxtaposed exterior is itself a work of art. Originally opened in the Hidalgo County Jail, the since-expanded Museum of South Texas History in Edinburg shares the Valley&apos;s rich history. Visitors can still explore the old jail before diving into the museum&apos;s permanent Rio Grande Legacy Exhibit. The exhibit features advanced multimedia components and bilingual text as it relates the region&apos;s history before and after European colonization. If you happen to be in Edinburg during early November, be sure to check out the museum&apos;s annual Día de los Muertos event. It includes dance performances, live music, arts and crafts, and a tempting selection of food. One of Laredo&apos;s oldest structures houses the Republic of the Río Grande Museum. Located in a home built in 1830, the historic house museum lets visitors experience Laredo during its early days. 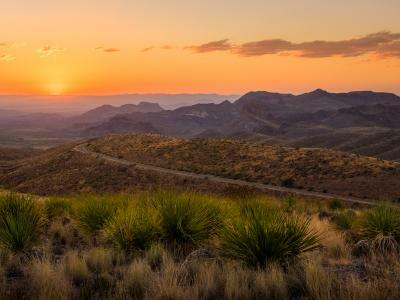 Not only does the museum replicate a bygone era, it&apos;s also a Texas Historical Landmark that may once have served as the capitol of the Republic of the Río Grande. Next door you&apos;ll find San Agustín Cathedral and the Border Heritage Museum, whose exhibits explore the region&apos;s culture, demographics, and history. In McAllen, you can get lost for hours in the International Museum of Arts & Science. One of my favorite things about the venue is its commitment to green education. As part of its Smart About Water Program, IMAS shows children the value of water in the Rio Grande Valley by letting them see how water works hands-on. Other science exhibits include Science on a Sphere, a planetary program designed by NASA and the National Oceanic & Atmospheric Administration, and RioScape, an interactive science playground. 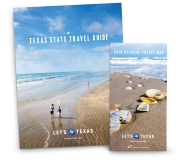 Texas has flown six flags throughout its history, but Laredo tops out at seven, having been part of the Republic of the Río Grande. Had the insurgency been successful, Laredo would have become Río Grande’s capital city. A Texas resident all her life, Andrea truly cannot imagine living, working, and playing anywhere else. She enjoys nothing more than inhaling queso and breakfast tacos, worshiping her pug, and breathing in the Texas air to remind her that she's home.